Информация Популярная программа для диагностики и мониторинга системы с набором тестов для CPU, motherboard, hard disks, optical drives, chipset. - CPU and FPU benchmarks to support 3-core and 6-core processors. - Disk Benchmark can now do disk write tests under Windows Vista. - Revamped System Stability Test module that will be able to stress and provide insight about your system’s CPU and memory like never before. - Support for nVIDIA nForce 750i/780i/790i chipsets. - Support for ATI Radeon HD 34xx/36xx and Radeon HD 3870 X2 family of graphics processors. - Support for nVIDIA GeForce 8800 GS, GeForce 8800 GTS 512, GeForce 9300M G, GeForce 9500M GS and GeForce 9800 GX2 family of graphics processors. - Support for Enhanced Performance Profiles 2.0. 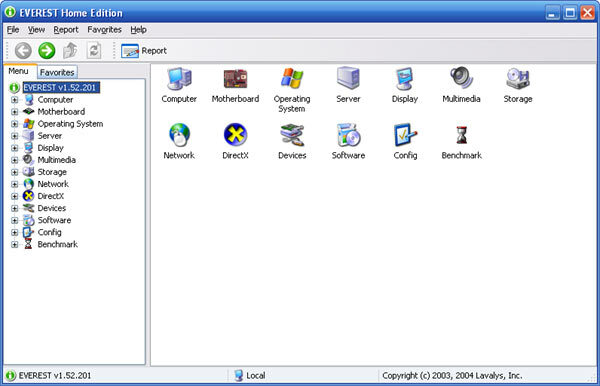 - Support for Microsoft Windows PE v2. - Support for PCI Express 2.0 controllers and devices. - Temperature readout for FB-DIMM memory modules. - ATA auto-detect and SMART information for USB and FireWire hard disk drives behind Cypress, JMicron and Oxford bridge chips. - SPD information for DDR3 memory modules with bad SPD CRC.